Being recognized as the world’s oldest living person is something of an honor — at least as measured by the competititive spirit that often seems to underlie the quest for the most super of planet’s supercentenarians. Just a couple years ago, 116-year-old Maria Esther Capovilla came suddenly out of Ecuador to swipe the title from Elizabeth Bolden of Memphis, Tenn., who until December of 2005 was thought to be the world’s oldest living person. Ms. Capovilla’s family apparently dropped papers on title-keepers at Guinness World Records, who then plucked the crown from Ms. Bolden. Now, whether the title comes with a curse is an open question — we’re talking about folks who, judged against the averages, appear to be already living on borrowed time, after all. But it’s true that Ms. Capovilla lasted only a little over six months, and the quick succession of title-holders after her makes one wonder if it wouldn’t be worth keeping one’s longevity a secret. Ms. Bolden took the crown again with Ms. Capovilla’s passing, but held on to it for just three months before surrendering to the fates. That elevated Emiliano Mercado del Toro of Puerto Rico — for about a month and a half. He died last Wednesday. Emma Tillman of East Hartford, Connecticut, then took up the baton. And today’s news: Ms. Tillman died on Sunday, at 114, after just four days as the oldest. 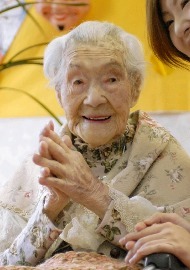 According to Guinness, that leaves 114-year-old Yone Minagawa of Fukuoka, Japan, as the new longevity leader. Minagawa has been living at the Keiju nursing home in the southwestern city of Fukuoka for several years and has a healthy appetite, though she seldom leaves her bed, nurse Sumako Katsuki said by phone late Monday night. “When she feels good, she ventures to the dining room by motorized wheelchair,” Katsuki said. To find out more, Wikipedia offers a decent overview of supercentenarians, with tables attributed to Guinness. Readers can also view the data compiled by the International Committee on Supercentenarians. Our current knowledge on cellular lifespan puts the natural limit on human longevity well below 150 years. Guinness Records of longevity oscillate from year to year in the range 110-125 due to miserable birth certification record from the late 19th century. Guinness Record statistics are soon likely to reveal the approximate true natural human lifespan limit. preview not available. Click the link for more information. A centenarian is a person who has attained the age of 100 years or more. The term is associated with longevity. Longevity is long life or existence. Reflections on longevity have usually gone beyond acknowledging the basic shortness of human life and included thinking about, and conceiving, methods to extend life (indefinitely). Longevity has been a topic not only for the scientific community but also for writers of travel science fiction and utopian novels. A supercentenarian (sometimes hyphenated) is someone who has reached the age of 110 years or more, something achieved by only one among hundreds of centenarians. In turn, only about one supercentenarian in fifteen lives to turn 114. Senescence is the state or process of aging. The word is derived from the Latin word senex, meaning "old man" or "old age." Cellular senescence is a phenomena where isolated cells demonstrate a limited ability to divide in culture. Organismal senescence is the aging of organisms. Organismal aging is generally characterized by the declining ability to respond to stress, increasing homeostatic imbalance and increased risk of disease. Because of this, death is the ultimate consequence of aging. While claims of extreme age have persisted from the earliest times in history, the earliest supercentenarian who has substantial scholarly acceptance is Geert Adriaans Boomgaard, who was born in Groningen, Netherlands, September 21, 1788, and died there February 3, 1899. This article is about Genesis, the first book of the Hebrew Bible. See Genesis (disambiguation) for other usages of the word. Genesis (Greek: Γένεσις, having the meanings of "birth", "creation", "cause", "beginning", "source" and "origin"; translated from Hebrew בראשׁית Bereshit or Bərêšîth) is the first book of the Torah (five books of Moses) and hence the first book of the Tanakh, the Hebrew Bible; it is also the first book of the Christian Old Testament. According to the Bible, Methuselah (Hebrew מתושׁלח Metushálach/Metushélach or Məthûšālaḥ/Məthûšélaḥ) was the oldest person who ever lived. He reportedly reached the age of 969 years. According to Genesis 5:27: And all the days of Methuselah were nine hundred sixty and nine years: and he died. (ASV) (chapter 5 verse 27) Methuselah This article is about the Biblical character. See Methuselah (disambiguation) for other uses. Today some maintain that the unusually high longevity of Biblical patriarchs are the result of an error in translation: lunar cycles were mistaken for the solar ones, and the actual ages are 13.5 times less. This gives 72 years for Methuselah, which is still an impressive number, bearing in mind the life expectancy of these times. This theory however, seems doubtful to others since patriarchs such as Mahalalel (5:15) and Enoch (5:21) were said to have become fathers after 65 "years." If the lunar cycle theory were accepted this would translate to an age of about 4 and 10 months. Jeanne Louise Calment (February 21 1875 - August 4 1997) had the longest (reliably reported) lifespan for any human being in history. Her lifespan has been thoroughly documented by scientific study. She married her second cousin Fernand Calment in 1896, and survived her only child and only grandchild. 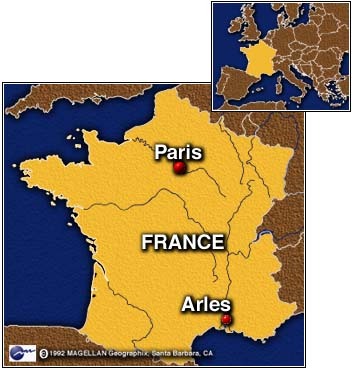 She died at the age of 122 years 164 days in Arles, France; the same town she was born in. She said that in her younger years, she met Vincent van Gogh, later describing him as "dirty, badly dressed and disagreeable." Shigechiyo Izumi (June 29,1865? – February 21, 1986) was a native of Japan famous for being the oldest living person and oldest living man in the world. Assuming his claimed birth date correct, he would have attained an age of 120, years longer than any other known male, and the second-longest documented lifespan in the world, less only than that of Frenchwoman Jeanne Calment. However, subsequent research has cast doubt on his claim, as what was previously believed to be his birth certificate may actually have been that of his older brother, who died young and whose name might have been reused as a necronym. If so, this would mean he was "only" 105 when he died. Fred Hale Sr, who became the world's oldest man on March 5, 2004, at the age of 113 years 95 days, has died. Fred was born on December 1, 1890, and took the title following the death of Spain's Joan Riudavets Moll. Fred Sr, from Syracruse, New York, was born in the same year as the Battle of Wounded Knee, Jack the Ripper was stalking the east end of London, and Arthur Conan Doyle was just starting to write his Sherlock Holmes stories. Supercentenarian Fred lived through 21 US Presidents, and was in his seventies when Neil Armstrong landed on the Moon! When he was aged 104, he even had his driving license renewed (pictured) and continued driving until he was 108! So, what was Fred's secret for long life? Honey and bee pollen, he said. A former postal worker and beekeeper, he ate at least a teaspoon of each every day (washed down with the occasional breakfast nip of whisky!). Nov. 20, 2004 - The world’s oldest living man, Fred Hale, Sr., died in his sleep Friday, while battling pneumonia. He would have celebrated his 114th birthday on Dec. 1. He drew national attention earlier this year for his devotion to the World Champion Boston Red Sox. Hale was recognized by the Gerontology Research Group at the UCLA School of Medicine and the Guinness Book of World Records on March 5, as the oldest living man, when he was 113 years and 95 days old. He succeeded Spain's Joan Riudavets Moll. When told he was the world's oldest man, he reportedly said, "I don't believe it. And I ain't going to die just to satisfy them." Hale was born Dec. 1, 1890 in New Sharon, Maine. He retired as a railway postal clerk in 1957. He lived most of his life in Maine. The Guinness record notes that in the year of his birth the world also saw the Battle of Wounded Knee, Jack the Ripper stalking London, and Arthur Conan Doyle starting to write his Sherlock Holmes stories. Guinness also notes he had seen 21 U.S. presidents and that he was also recorded as the world’s oldest driver – his license does not expire until 2008. He was able to cut the cake at his 113th birthday, according to his 83-year-old son, Fred Jr. The oldest living woman recognized by Guinness is Ramona Trinidad Iglesias Jordan of Puerto Rico, which meant that, for only the second time ever, the world's oldest living man and oldest living woman both were U.S. citizens. Haled died in a suburb of Syracuse, New York, at below is an excerpt from a column about him by Syracuse Post-Standard columnist Sean Kirst. “Around the world, Fred Hale Sr. will be eulogized in this way: The oldest man in the world was a Boston Red Sox fan who kept waiting, year after year, to see his team win it all. “This autumn, barely a month short of his 114th birthday, Hale finally got to enjoy that Red Sox title. He died in his sleep Friday at The Nottingham in DeWitt, just 23 days after that World Series triumph, as if it left him free to say farewell. “It makes for one more fitting tale about these already legendary Sox, except that it isn't altogether true. His wife, Flora, was a fan. Until her death in 1979, she'd often listen to the games in the living room of their home in Maine. Their five children joined the Red Sox nation due mainly to their mother's loyalty. As the children grew up, Hale noticed the way they all cared about the team, and he ended up going to his share of games at Fenway Park. Hale outlived his wife and three of his five children. He had nine grandchildren, nine great-grandchildren and 11 great-great-grandchildren. The world’s oldest living man is now Hermann Dornemann, of Germany, age 111. There are 26 living women older than him, according to Gerontology Research Group. A funeral service for Hale will be held Tuesday at Hobbs Funeral Home in South Portland. He’ll be buried in Farmington, Maine. DEWITT, N.Y. (AP) — Fred Hale Sr., a Maine native recognized as the world’s oldest man, died Friday. He was 113 years old. Hale died in his sleep at The Nottingham in suburban Syracuse, while trying to recover from a bout of pneumonia, said his grandson, Fred Hale III. He was 12 days shy of his 114th birthday. Born Dec. 1, 1890, Hale last month watched his lifelong favorite baseball team, the Boston Red Sox, win the World Series again after 86 years. Hale retired in 1957 as a railroad postal worker and beekeeper, his grandson said. He enjoyed gardening, canning fruits and vegetables and making homemade applesauce. "He had a routine and he rarely broke it because anyone else was around," Hale III told The Post-Standard of Syracuse. "He didn’t need a lot to be happy." At age 95, Hale flew to Japan to visit a grandson who was in the Navy. While en route back to the United States, he stopped in Hawaii and even gave boogie-boarding a try. At 103, Hale was still living on his own and shoveling the snow off his rooftop. He was born in New Sharon, Maine, when there were only 43 stars on the American flag. He married Flora Mooers in 1910. Hale lived in his native Maine until he was 109, when he moved to the Syracuse area to be near his son, Fred Jr., now 82. On March 5, 2004, the Guinness World Records acknowledged him as the oldest living man when Joan Riudavets Moll, of Spain, passed away at age 114. Hale also was a Guinness record-holder for the oldest driver. At age 108, he still found slow drivers annoying, Fred Hale III said. Hale outlived his wife, who died in 1979, and three of his five children. He had nine grandchildren, nine great-grandchildren and 11 great-great-grandchildren. Hale credited his longevity to bee pollen and honey that he ate each day, along with the occasional nip of whiskey in the morning. A retired Dutch needlework teacher with a passion for soccer and a taste for herring celebrated her 114th birthday yesterday with a place in the record books as the world's oldest person. Hendrikje van Andel-Schipper was declared the world's oldest woman - and person - by Guinness World Records when the previous 114-year-old title holder Ramona Trinidad Iglesias Jordan of Puerto Rico died last month. Van Andel-Schipper, who will celebrate her birthday in a retirement home in the northern Dutch town of Hoogeveen, was born in 1890. The white-haired Dutch woman has seen electricity, the telephone, the car, the plane and space travel transform the world during a life time linking the three centuries, and lived through two World Wars. Her local municipality is throwing a birthday party for Van Andel-Schipper - who has become the town's biggest celebrity - at her retirement home. She will also answer questions from the media at a news conference. "She never spends a whole day in bed and her health is still good. However, her eyesight and hearing are not as good as when she was 108," Guinness World Records said. The frail, white-haired woman, harbours a passion for Dutch soccer team Ajax Amsterdam and listens to a weekly radio soccer program although she has not reportedly gone to a game in decades. The daughter of a rural headmaster, she was born in the town of Smilde in the northern Netherlands on June 29, 1890. She married a tax inspector in the 1930s and was forced to sell her jewellery to buy food during the German occupation in WWII. She was widowed after 20 years of marriage. "I think it is nice to have lived to be this age. I'm not scared of death. Everyone has to go. I hope I don't have to suffer, that they find me dead in bed one day," she told a Dutch newspaper. Although a Lebanese woman who has documents showing she was born in 1877 - making her at least 126 years old - could be the oldest person in the world according to a report earlier this month, Guinness World Records have not verified this. "The oldest verified person is Hendrikje," a spokeswoman for Guinness World Records said. Retired US postal worker and beekeeper Fred Hale, who was born on December 1, 1890, is the world's oldest man, according to Guinness World Records, which collects, confirms and presents information on world records around the world. A woman aged at least 124 years old has been found in the war-torn republic of Chechnya. Zabani Khachukayeva's passport states that she is 124 years old, however doctors believe that she may be even older. Apart from having impaired hearing, she is in relatively good health and says that she still feels energetic. Khachukayeva has outlived her eldest son, who died in 2001, and has 24 grandchildren, 38 great-grandchildren, and 7 great-great-grandchildren. Until Ms Khachukayeva was found, the title of the world's oldest living person was held by 113 year old Japanese silkworm breeder Yukichi Chuganji. SOURCE/REFERENCE: Reported by www.guardian.co.uk on the 30th July 2003. NORTH LIMA, Ohio (AP) May 16, 2004 - Charlotte Benkner, recognized as the world's second oldest person, has died. She was 114. Benkner died Friday at St. Elizabeth Hospital in Youngstown, John Sheridan of Fox Funeral Home in the Youngstown suburb of Boardman, said Sunday. He did not have a cause of death. Her nephew's wife, Mary O'Hare, said Sunday that Benkner had been in the hospital for the past two-and-a-half weeks. The Guinness Book of Records recognized Benkner as the oldest person in the world in November, but it replaced her with a Puerto Rican woman last month. Benkner and her husband of 56 years, Karl, had no children. TOKYO, Nov. 13 — A 114-year-old Japanese woman who had assumed the title of the world’s oldest person last month died Thursday, a spokesman for Hiroshima city said. MITOYO KAWATE, born on May 15, 1889, died November 13, 2003 of pneumonia at a local hospital, said Masatoshi Yamada. Kawate was hospitalized earlier in the day when her condition worsened. London-based Guinness World Records recognized Kawate as the oldest person alive on Oct. 31 after the previous holder, Kamato Hongo from southern Japan, passed away. Kawate, who had four children, was a farmer in Hiroshima until she was 100 years old, Yamada said. She is survived by a son and a daughter, but Yamada did not have details about grandchildren or other relatives. Kawate had a weakness for custard cakes and liked to sing, but her condition had weakened in the past two years, a caretaker said earlier this month. She had been living in a nursing home for the past 10 years. The family of an Albanian woman said to be 123 years old had also claimed the title, and had tried to get Guinness World Records to recognize her as the oldest woman before her death earlier this month. Hava Rexha, was born on Aug. 14, 1880, but didn’t receive a birth certificate until 1946. She lived south of Albania’s capital of Tirana and died last weekend. Japan has lost three world record holders for longevity in recent months. Hongo’s death was preceded by the death of the world’s oldest man, 114-year-old Yukichi Chuganji, on Sept. 29. After Kawate’s death, Ura Koyama, a 113-year-old woman from the southern main island of Kyushu, became Japan’s oldest person. Koyama was born Aug. 30. 1890. Kameni Nakamura, 109-year-old man in Okinawa prefecture, is Japan’s oldest man. Japan leads the world in longevity thanks in part, experts say, to the traditional Japanese diet which is low in fatty foods. The country’s life expectancy — 85.23 years for women and 78.32 for men in 2002 — is the longest in the world. A Japanese woman believed to be the world's oldest person has died aged 116. Kamato Hongo died in hospital on Friday, one of her grandsons said. Mrs Hongo, who lived on the island of Tokunoshima in southern Japan, had been bed-ridden for some time. She had seven children and at least 27 grandchildren. 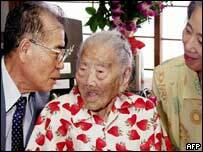 The world's oldest person is now believed to be 114-year-old Mitoyo Kawate, a Japanese woman living in Hiroshima. Mrs Hongo was well-known throughout Japan for her habit of sleeping for two days and then staying awake for two days. Her grandson Tsuyoshi Karauchi, who lived with her, told the BBC last month that sleeping was a favourite pastime for his grandmother. "We even feed her in her sleep," he told the East Asia Today programme. Mr Karauchi said his grandmother, like a lot of other elderly people, ate miso soup, rice and vegetables. Asked about the secret of her longevity, he said: "She was brought up in a good environment, ate healthy local food. She survived the war but apart from that it's been a peaceful happy life." She has never smoked, he said, "but she did start drinking about 20 years ago in her 90s". Japanese have the longest life expectancy in the world. Their diet of fish and green vegetables is thought to contribute to their longevity. Economists are predicting a crisis in the state pension system within a few years, because the benefits being paid out far exceed payments being made into it. January 27th, 1875, was the date that Dominica saw the birth of its most illustrious daughter, Elizabeth Israel. According to official records of The Roman Catholic Church (Roseau Diocese), Magdeline Israel, mother and an undocumented father gave birth to baby Elizabeth. Although Elizabeth's mother resided on The Colihaut Estate situated on the west coast of Dominica, she while in an advance state of her pregnancy with Elizabeth; migrated (by foot) to an area of The Picard Estate called Tibay. It was in Tibay that "Pampo" was born and being the first of her mother's six children, she enjoyed the luxury of their trash covered, mud-paved house. "Pampo" grew up to be the second mother of the family making way for her mother to continue her duties as a laborer on the Picard Estate, where she worked for less than a penny a day. It was not long however, at the age of 12 that Elizabeth who was then a student at the Portsmouth School, joined the labour force on the same Estate. School days for "Pampo" was over and it was survival time. The years were long, time was hard but with determination, sweat, and courage "Pampo" persevered. Her direct quotes will fully disclose those years of trials. 126 years after her birth, (soon to be 127 in a couple of weeks), this lady is still alive and well. Pampo the world's oldest, ever documented human, currently resides in Glanvillia, Dominica, W.I. In July, several residents of the Roseau Infirmary had an outing to Portsmouth and stopped in for a visit with Ma Pampo. Photo by Sister Catherine. © 2001 All RIghts Reserved. The Pampo Foundation is a non-profit charity geared at promoting mainly the long life mystery of Elizabeth "Pampo" Israel and other Dominican centenarians. Pampo, who was born on the 27th day of January 1875, is the World's oldest ever documented human (according to Neil Haynes - Spokesman for Guinness World Records in London, although Guinness has not conferred that official title on her) and the foundation will frantically promote her as a genuine gem and a real wonder in the Nature Isle. The foundation will also promote Pampo as a Dominican Treasure and no efforts will be speared at capitalizing on her amazing achievement. Pampo is indeed a hero and advancements will be made at endorsing her as a certified National Emblem in whose honor a National Holiday should be declared. The Foundation will also seek to advise that Pampo be awarded the highest Award in the Island of Dominica (The meritorious Award). The foundation expects to work with Government to ensure coherence in the promotion of this stalwart woman and will make representations on her behalf at every forum. The foundation will work for or towards the long term good of Pampo, her generation and the other Dominican centenarians and their relatives at all times. The foundation will endeavour to coordinate all media releases, promotion and other such activities on behalf of Pampo and will responsibly inform her relatives and friends of its every activity. The foundation will lobby on the behalf of Pampo at all times for any and every benefit associated with such a long life feat including official recognition by Guinness World Record and other such organizations. Each year, the foundation will organize a Cultural Exposition honor of Pampo, to coincide with her birthday. It will be the responsibility of the foundation to embark on a full-scale program of education with respects to the amazing facts about Pampo and the other Dominican centenarians such as Rose Peter from Glanvillia who was born on February 21st 1893 and had survived 118 years to the date of the foundation. The Foundation will also pay very close attention to Rose Peters, she being the second oldest person in Dominica and the world. Her legacy is also very important to Dominica and we will promote her alongside Pampo and our other major long life achievers. Education is key of the Pampo Foundation with its target demographics being School age children, students at all levels and other interest groups. In that light, the foundation has so far embarked on a Caribbean Tour of High School in selective Countries from Anguilla to Trinidad and Tobago, beginning September 14th 2001. The exercise dubbed Healing 2001 will be the yet another bold venture at establishing the facts about Pampo. The primary long-term goal of the foundation would be to publish a hard cover book entitled QUEEN PAMPO in her honor; other centenarians will be captioned in that publication. The most ambitious project will however be a history School or Fortress (The Pampo History Fortress). We expect that such a fortress would be built on a portion of the land in Glanvillia where Pampo had resided for over half a century. The foundation will comply with all the applicable laws of the Commonwealth of Dominica and the United States of America as pertains to such non-profit organization. Dominicans yesterday celebrated the birthday of the World’s oldest living person Elizabeth (Ma Pampo) Israel who turned 128 even as government vowed to increase pressure on Guinness World record officials to officially confer the title on the Dominican. Unfortunately, the Guinness World record has not officially recognized Ma Pampo since they are still in the process of verifying the claim. A Baptismal certificate has been issued by the Roman Catholic Church with her birth date stated as January 27, 1875, but since it is not an official record, it cannot be used to authenticate the claim. The claim was further thrown into doubt when it was learned that at some point in her life she was called Minetta George. Guinness officials have said that it is important to clarify these various issues before the title can be conferred. Given the state of record keeping during that time in Dominica, it may be difficult to collect collaborative evidence to substantiate the claim. At the age of 128, Elizabeth (Ma Pampo) Israel is considered the World’s oldest living person. Born in Portsmouth, Dominica, and the daughter of a slave, she started working on a plantation at the age of 25 and retired 79 years later. Ma Pampoo ascribes her longevity to her diet--including lots of dumplings and bush tea. She has survived her husband and two children. There are at least seventeen centenarians in Dominica (with four residing in close proximity to Ma Pampo), from a population of 70,000 making it the country with the highest concentration of centenarians per 1000 of the population. Dominica’s pristine, largely untouched and unspoilt environment, which lies largely unpolluted, has been cited as the main reason for longevity on the Island. Ramona Trinidad Iglesias Jordan was born in 1889. SAN JUAN, Puerto Rico (AP) -- Ramona Trinidad Iglesias Jordan, who at age 114 was recognized as the world's oldest person, has died after a bout with pneumonia, her family said Monday. Iglesias died Saturday in a nursing home in San Juan, said Rene Matos, a great nephew who lives in El Paso, Texas. She was three months from turning 115. "I was hoping she could make it to her 115th birthday, but it was impossible," Matos said by telephone from Texas. "She was in the hospital about four or five days, and the day after she was released she died in the nursing home." Iglesias earned the distinction in April when Guinness World Records declared her the world's oldest living woman after a check of documents. A baptismal certificate showed Iglesias was born August 31, 1889, while a birth certificate issued in 1948 showed her birth date as September 1, 1889. Fred Hale Sr., 113, of Syracuse, N.Y., is listed by Guinness as the world's oldest man. He was born on December 1, 1890. Her death could make Hendrikje van Andel-Schipper, 113, of the Netherlands the oldest living person, according to news reports. She was born in Smilde on June 29, 1890. Matos, 64, said he thinks her longevity stemmed from her having "a very easy life -- easy in the sense that she didn't have too much to worry about." Her husband was a bank manager in the 1940s and '50s who passed away in the 1970s, Matos said. They never had any children and lived peacefully, he said. She enjoyed a beer with meals, Matos said. "Even when she was over 100 years, every time we took her out to a restaurant, she always liked to have a beer, a small beer, a 7-ounce beer with the food," he said. "That was the first thing she asked for when she got to a restaurant." Iglesias was born near the end of Spanish rule in Puerto Rico, which was seized by the United States in 1898. BEIRUT, Lebanon (CNN) -- Spry Frenchwoman Jeanne Calment has been drawing much of the media spotlight as of late with her claim to the title of world's oldest person at the tender age of 122. But she may have met her elder in Lebanese farmer Ali Mohammed Hussein. An identity document issued by the Lebanese government shows that Hussein was born in 1862, which would make him 135 years old. If accurate, that would mean he was already a teen-ager when Calment came into the world. Hussein would also be 21 years older than Christian Mortensen of Denmark, who currently claims the title of world's oldest man at age 114. A charcoal burner and farmer, Hussein says he was born in Qinieh, a village about 90 miles (150 km) north of Beirut in the rocky uplands of northern Lebanon. His wife, Amsha, is 90, and, according to his oldest son, Hussein has at least 93 direct descendants. Hussein's identity document is based on a compilation of population statistics made by the Lebanese government in 1932. It is registered in the Interior Ministry's records, but its authenticity could not be independently verified.